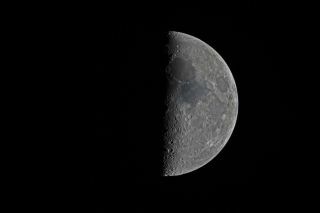 A first-quarter moon, imaged by night-sky photographer Victor Rogus on Jan. 18, 2012. The moon will be 47 percent illuminated this Saturday (June 11, 2016). If the weather is clear on Saturday night (June 11), check out the western sky around mid-twilight to see Jupiter hovering close to the full moon. About an hour after sunset, look to the west-southwest horizon and not quite halfway up to the overhead point, where you'll see an eye-catching sight: an almost-first-quarter moon, 47-percent illuminated, and a brilliant silvery white "star" hovering about 4 to 5 degrees to the right of the moon. Because they will be the two brightest objects in the sky, both the moon and Jupiter will likely attract the attention of even skywatchers who aren't looking for them. As the night progresses, the two celestial bodies will appear to descend in the sky, finally disappearing beyond the western horizon just after 1 a.m. local time. This is the last month in which our solar system's largest planet is high enough in a dark sky to permit crisp telescopic views of its cloud patterns and four big satellites. Jupiter will shine near the moon, as seen in this Starry Night Software sky map, in the southern night sky on June 11, 2016. This map shows the location of Jupiter at 9 p.m. local time as seen from mid-northern latitudes. Next to Venus, Jupiter is the brightest star-like object in the evening sky, and among the first bright objects to become visible each night at dusk. But for the rest of June and on into July, Jupiter will slowly slip farther down the horizon each night in the west-northwest. By the first week of August, it will be setting right around the time evening twilight ends. This month, Jupiter is falling far behind Earth in the never-ending planetary race around the sun, and Jupiter continues to move slowly eastward among the stars. Currently, it can be found in the zodiacal constellation of Leo, the lion. Because it takes nearly 12 years to orbit the sun, Jupiter spends about a year in each of the 12 zodiacal constellations. Jupiter moved into Leo in early June 2015 and will exit Leo and move into Virgo early in August 2016. The real drama, however, will be getting underway a month from now. As you admire Jupiter and the moon on Saturday night, take note that, in mid-July, if you're really ambitious, you can try using binoculars to pick Venus out of the bright twilight only about 15 minutes after sunset. That is only the beginning of an agonizingly slow return of Venus to the evening sky for viewers at mid-northern latitudes, the start of its slow march into prominence as a grand "evening star" in late fall and winter. From mid-July onward, Venus and Jupiter will be slowly getting closer to each other; Jupiter will slowly go down in prominence as Venus comes up. And on the evening of Aug. 27, Jupiter and Venus will appear exceptionally close together, being separated by just 4 arc minutes, or a mere 0.066 degree. That's much closer together than the apparent width of the moon — a real head turner that will likely attract considerable attention. Make a note on your calendar, and let's all hope for clear skies. Editor's note:If you snap an amazing photo of Jupiter and the moon and would like to share it with Space.com and our news partners for a possible story or image gallery, send images and comments to managing editor Tariq Malik at spacephotos@space.com.